You may find yourself failed to delete some files on iPhone and don't know how to do. 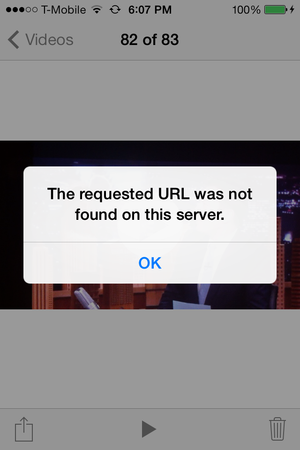 Your iOS may stop working and start showing error messages. Corrupted files should be responsible for this. Corrupted files are easy to be produced. For example, all the media that we store in our iPhone, either in the form of our top favorite music playlist or a bunch of memorable videos, might vanish away one fine day by turning into numerous unwanted corrupted files. Besides, unplugging iPhone when transferring media files will also create corrupted media files. Part 1: What Causes Corrupted (Media) Files on iPhone? What Causes Corrupted (Media) Files on iPhone? While you certainly cannot fix corrupted files, the next possible solution for you is to delete such corrupted files as they are consuming huge space on your iPhone. You cannot delete corrupted media files manually, but you can use iOS cleaner to make it. We have an excellent recommendation - iMyFone iOS Cleaner or iMyFone iOS Cleaner for Mac. 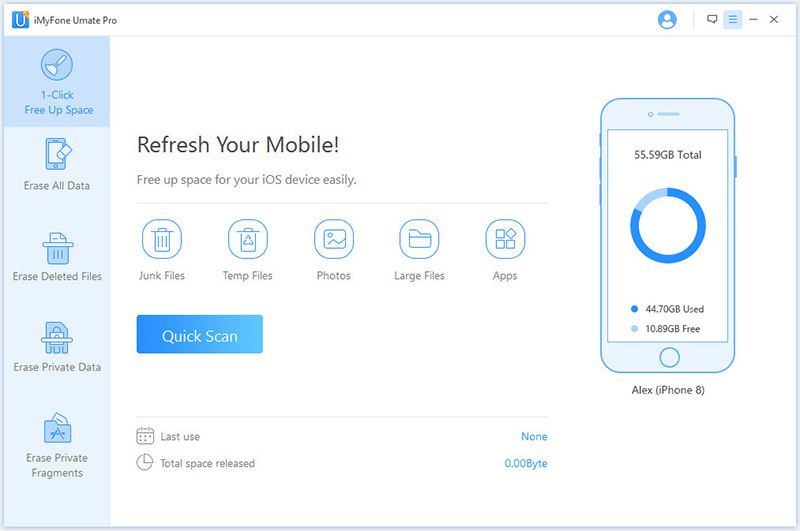 It's an all-in-one solution iOS space saver that can remove all the useless files from iPhone, like cache, crash logs, user storage files, downloaded temp files, etc. Clear Corrupted Files for Free - It can remove invisible corrupted and partially synced music, video and any other files, and free up huge space on iPhone. How to Throroughly Delete Corrupted Files on iPhone? Step 1. Launch iMyFone iOS Cleaner on your computer and Connect your iPhone with a cable. Step 2. Click on "Quick Scan" on the home interface and it will do a full space-saving analysis. Step 3. Click on the "Clean" botton beside "Junk Files." Click "Clean" again to confirm. Note: You’ll be provided with detailed junk files. In this, you’ll see iTunes cache along with other junk files, like crash logs, photo caches, etc. iTunes cache contains all the files that didn’t sync properly. If want to totally remove all iPhone corrupted files, you should also go to the tab of "Erase Deleted Files" and "Erase Private Fragments", so as to make sure that even previously deleted files will be cleaned up. Erase Deleted Files - Most of these deleted files are still left on hard drive, which also belongs to corrupted files. iMyFone can find them and completely wipe them from iPhone, and erased data no longer exists and is no longer recoverable. Erase Private Fragments - All the traces left by third-party apps are corrupted files as well, which should be safely erased to avoid privacy leak. Cleaning up 30+ Junk files & massive temporary files to release iPhone space - most corrupted files are removed in this process. This feature is also available in the trial version of the software to help you know whether or not it is actually effective. Export / Compress or mass delete all photos (corrupted photos included) with backup on PC previously. Export / Deleting large files with auto backup on PC - give you the option to find out and delete all large files over 5MB on your iPhone, corrupted videos included. Manage Apps - list all Apps installed on your iPhone, corrupted Apps included, you can preview and bulk delete them. Erase previously deleted corrupted files - detect and find out all your deleted files (including many corrupted files), then permanently erase them. Permanently erase private iOS data - erase message, call history, Safari history, WhatsApp/WeChat messages & attachments, notes, voice memos, etc. the erased data is 100% unrecoverable. Erase Private Fragments - This feature can erase almost all corrupted fragments of third-party Apps, like Snapchat, WeChat, Facebook, Youtube etc. Thrashing away infected and corrupted media files from your iPhone or other iOS devices is one challenging task. iMyFone Umate is highly recommended to remove and delete corrupted media files from iPhone in a simple yet convenient manner. As you can see, the software is very easy to use and is compatible with iPhone, iPad, and iPod touch. 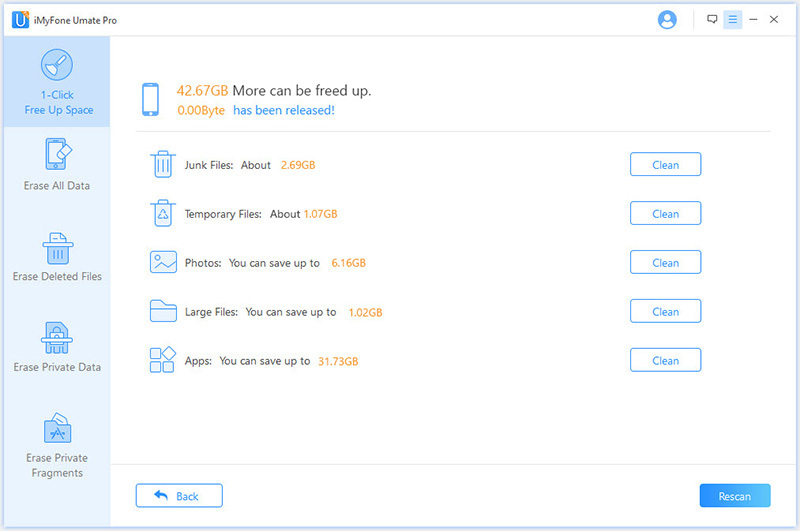 Apart from clearing corrupted files, iMyFone Umate also can help you make your iPhone iPad run faster, remove junk files, temporary files, compress photos and a lot more.